A loaded question, I know. But you'd be surprised at the answers that I get. Let's take a look at a few of them. When I took a survey in a class that I was teaching, most of the participants answered scrub or exfoliation. While exfoliation is extremely important in caring for your skin, I would not say that it is the "most" important. The rationale was that it lifted and sloughed away the dead skin cells making your skin smooth and helped in evening out your skin tone. The next greatest response was drinking plenty of water. Drinking plenty of water is important to the beauty of your skin from within. Water helps in flushing out toxins that are found in your colon, your blood and your cells. Third on the list of answers was to moisturize. Even though most African Americans think that their "Black don't Crack", the class felt that a moisturizer was important to the health of their skin. Surprisingly, cleansing did not top the list of being most important in black skin care. 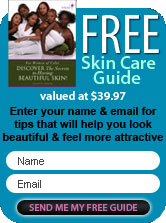 When caring for African American Skin or any skin of color, I feel that a good "skin care regimen" is crucial. None of the steps above should be separate of each other. Cleansing - This step should always be first. I actually had someone tell me that they didn't consider this a necessary step in and of itself. When you cleanse your skin you are actually removing dirt and debris that has built up during the day and at night while you sleep. Unless you change your pillowcase every night, you are sleeping on dead skin cells from the previous night. I know, this is not a welcoming thought. Toning -While some people don't believe it to be a necessary step, I do. A light toner will bring your skin's pH level back into balance. The toner also set a great base for your moisturizer. Moisturizing - If you-re extremely oily, a moisturizer may not be necessary for you. But since a lot of the oily sections of your skin are in the T-Zone area (across your forehead and down the center of your face), you should moisturize your cheeks to balance out your face. While this regimen is for basic skin care, you should definitely add an exfoliating process and mask to your regimen twice a week. It makes your skin care regimen/system complete.